A new trade war sparked by US automotive tariffs has the potential to do much more damage to global economic growth than the US-China trade conflict has done. 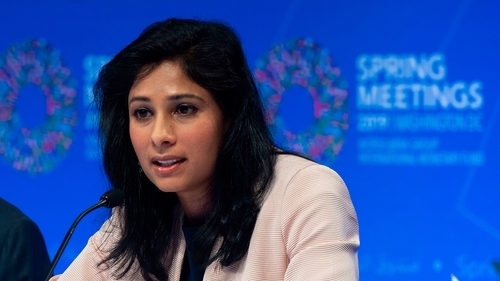 This is according to the International Monetary Fund's chief economist Gita Gopinath. Gopinath told Reuters in an interview that such a conflict would affect exports from many more countries and impose retaliatory duties on US goods from numerous trading partners. "We are concerned about what auto tariffs would do to the global economy at a time when we are more in the recovery phase," Gopinath said on the sidelines of the IMF and World Bank annual meetings in Washington. Should trade conflicts spill over into the automotive sector, it would also disrupt larger parts of global manufacturing supply chains, she said. "So that would actually be far more costly for the world economy than just the US-China trade tensions that we had," said Gopinath, an Indian-born, Harvard University professor. US President Donald Trump has threatened to levy tariffs of some 25% on imported vehicles and auto parts on national security grounds, invoking a 1962 trade law aimed at safeguarding the Cold War-era military industrial base. Trump has openly admitted that he is using the threat of auto tariffs to draw trading partners including Japan and the European Union into trade negotiations. But he also has recently threatened to impose car duties on Mexico unless it improves security at the US border. The US Commerce Department has submitted recommendations of its "Section 232" study into whether automotive imports constitute a threat to national security to the White House but has not revealed its contents. Under the Section 232 provision, Trump has until about May 17 to act on any automotive tariff recommendations contained in the report. Should he impose tariffs, they would hit hard in the second half of 2019, about the time when the IMF is predicting are bound in global growth due to a pause in interest rate hikes by the Federal Reserve and other major central banks. According to the IMF's World Economic Outlook released earlier this week, the growth rebound is set to continue into 2020, but the Fund has warned that the outlook was "precarious" and vulnerable to numerous risks. Gopinath said trade was the biggest among these risks, which also include rising corporate and sovereign debt, stresses in some large emerging markets and a chaotic exit of Britain from the European Union. But she said that a trade deal between the US and China had the potential to lift global growth if tariffs on Chinese and US goods are removed. The Fund's latest forecasts assume that 25% tariffs on $50 billion worth of Chinese goods and 10% tariffs on $200 billion in Chinese goods remain in place. US and Chinese negotiators are working to try to complete an agreement. "If it turned out that all tariffs were lifted between China and the US that were put in place last year, then that would be a positive to the outlook," the IMF's economist said. She said the impact on growth is highly dependent on the contents of the deal, and a deal that fails to resolve the tensions for the long term could leave a cloud of uncertainty hanging over business investment - a factor that sapped growth in 2018. "We've been pushing for an early, durable resolution of the trade tensions," she said. "Not something that will be revisited every three or six months," she added.